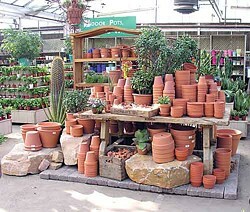 A display of terra cotta pottery at Bachman's Garden Center in Minneapolis, Minnesota. Photo courtesy of Bachman's Garden Center. First, they all want to grow rhododendrons. Go figure! Do you have any idea what it takes to get a rhododendron through a Minnesota winter? And when the shrubs do bloom, leaves emerge on top of the flowers almost immediately, covering them up so you can't see them. So now the task is to breed a rhododendron that will act like a rhododendron in that climate. Oh -- and Japanese maples! Can you imagine growing your Japanese maple in an enormous pot and bringing it in all winter long? I met gardeners who have entire rooms devoted to plants they overwinter inside, resulting in serious marital tensions over the long, dark months of winter. And all I could think was, if you want a garden full of Japanese maples and rhododendrons, why not move to Humboldt County? But who am I to quibble with the gardening habits of people who can't even put a shovel in the ground until sometime in May? Here's the most worthwhile adaptation to the cold that Minnesotans have made: a darn good wine grape called Frontenac, bred by the university by crossing a cold-hardy native grapevine with a French wine grape so that it will survive the snow and ice. It makes for a darn good red: dry, herbal, woodsy, easy to drink but not quite like anything you've had before -- and in a good way. I drank more than my share of a bottle of Alexis Bailly Vineyard's Voyager, and it was like discovering that there was a country between Italy and Spain that I hadn't heard of before that produced smart, obscure wines. Seriously, you could take a bottle of this to a dinner party and actually end up being the hippest person at the table for introducing California wine snobs to a really good Minnesota wine. Try it sometime. But here's the most amazing part about the Minnesota gardening experience: Bachman's. 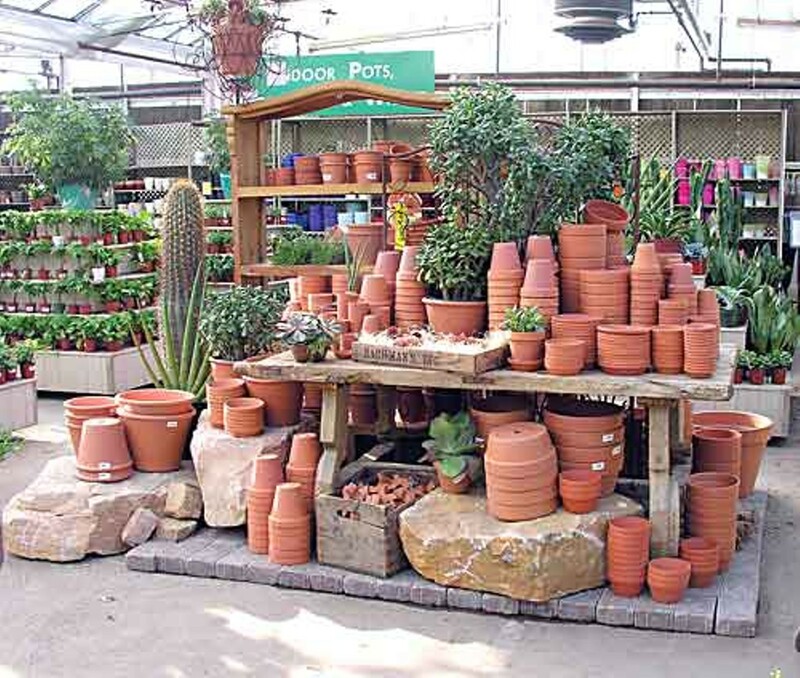 I had heard about this family-owned local chain of garden centers, and I knew that they were considered a sort of 'destination' garden center -- the kind of place an out-of-towner would want to check out, even if she couldn't fit a lot of plants in the suitcase. So I asked my friends to take me there. Let me tell you: You have never seen anything like this. The Bachman's store on Lyndale Avenue is a don't-miss experience, so promise me right now that if you ever find yourself in Minneapolis, you'll make the time to get over there. You might even want to plan a trip just to see Bachman's. I know what you're thinking: big, pretty garden center, maybe a little coffee shop, nice gift store -- big deal. Seen it. Oh, how wrong you would be. Bachman's is like the Macy's of garden centers. And not, like, the Santa Rosa Macy's. No, Bachman's is truly the glittery, big city, luxurious and over-the-top fancy shopping extravaganza of the plant world. We're talking the downtown Seattle Nordstrom's. The Union Square Macy's. The Saks that is actually on Fifth Avenue. Only with plants instead of shoes. Some of you have already stopped reading and booked your tickets. I know. It's too much to contemplate. You could actually shop all day long -- all day! -- and never see a single dazzling trinket that is not somehow related to gardening. The gift department alone is worth a few hours. Jewelry. China. Fancy vases. Scarves. Fountains. Pots. I don't even know how to convey the fabulousness of the gift department to you. Words fail me. Then there's a huge flower shop -- Bachman's is a full-service florist with locations all over town and cheery purple vans that deliver the flowers -- and a full-sized card shop. I got to take a behind-the-scenes tour of their floral department, and seriously, it's bigger than most wholesale markets I've seen. If you go, try to score a tour. It will blow your mind. Oh, and the plants. One greenhouse after another full of cheerful blooming annuals, perennials, herbs and vegetables, houseplants, gift plants, trees, shrubs -- really, every time I turned a corner, I'd see another sales floor larger than most ordinary garden centers, all devoted to yet another category of plant. The hard goods department -- that's garden center speak for tools, seeds, fertilizers, and so forth -- was as large as most grocery stores, with just as many cash registers open. They had everything. Every. Thing. And then there's the café. Bachman's put in a fancy little bakery and a lovely deli that does high-end sandwiches and salads, and you take your food and sit in an extraordinarily elegant and oversized version of a greenhouse, with the glass roof high above you, and plants and deliciously tempting merchandise stretching on for acres around you, and some kind of elegant jazz floating through the air, or maybe that was just in my head. It was lovely in the spring, but can you imagine how rejuvenating it would be in the middle of a long, frozen winter? Bachman's stays open until nine every night in summer, and until eight the rest of the year. I'd be there every night until close. If they would only put in a bar I bet they could keep the place hopping until midnight. No one on staff could tell me how big it was -- everyone would just sigh and look around, as if such an enormous space was impossible to measure -- but I did a little research and learned that the retail floor space is 230,000 square feet. By comparison, the new Eureka Co-op is 28,800 square feet. So imagine almost 10 of those. Wow. That's my horticultural report for the week, folks. I'm on the road a lot right now, so don't be surprised if the next dispatch is also from some far-flung location. Meanwhile, you know what to do: Stick some tomatoes in the ground, water, wait. See you soon.